Across Japan, there is a chain of second-hand shops called Hard Off. There is also a used book retailer known as Book Off. 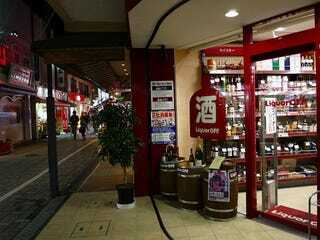 And now, there's also a store specializing in second-hand alcohol called Liquor Off. Located in Tokyo, Liquor Off wants to buy your unwanted booze. No wonder the shop says "Please sell" in Japanese! Liquor Off will buy all kinds of alcohol, including cans of beer. That's right, you can sell cans of beer. Liquor Off, however, won't buy your opened or half-finished booze or your experienced cans of beer. Instead, the shop hopes to acquire alcohol people get as gifts or simply never got around to drinking, so it can resell them at a discount. Liquor Off will even buy those little bottles of booze from airplanes. The result is an eclectic second-hand shop, filled with other people's liquor.